In Demo 16, we knew how to update firmware OTA for a batch of Arduino ESP32. Actually, the method behind that tutorial is UDP protocol. In this tutorial I will show you another way to update firmware for ESP OTA. That is using HTTP and sdcard. It means we will use Http to download the firmware from Http Apache server to sdcard and then flashing downloaded firmware from sdcard to ESP. Note: In case you do not want to store firmware file in sdcard, I will make another demo without using sdcard Demo 35. 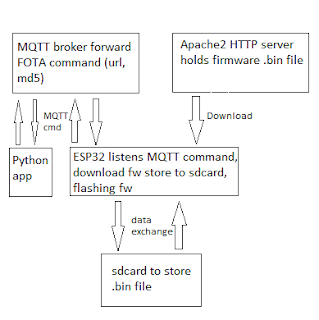 ESP will receive MQTT command (including url to download .bin firmware file and md5 value of that file to verify whether downloading and flashing firmware is correct or not) from Python application "fotacontrol.py". After downloading and flashing process was finished the ESP send "ok" to Python application to notify the updating process was finished. - startDownloadCallback: is the function that will be invoked before starting downloading. I used it to open firmware file in sdcard for writing downloaded data. - endDownloadCallback: is the function that will be invoked after downloading was finished. I used it to close firmware file in sdcard after finishing writing downloaded data. - startFlashingCallback: is the function that will be invoked before starting flashing downloaded firmware. I used it to open firmware file for flashing. - endFlashingcallback: is the function that will be invoked after flashing was finished. I used it to close firmware file after finishing flashing. - saveDataCallback: is the function that will be invoked to save downloading data to sdcard. I made it in generic way so that the library can be applied for SPIFFS. - readDataCallback: is the function that will be invoked to read data from sdcard for flashing. I made it in generic way so that the library can be applied for SPIFFS. The code "SD.begin(32, 14, 12, 27)" is ti initialize SD card before operating on it. 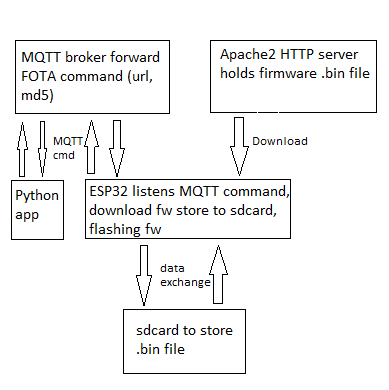 The Python application is quite simple, It has 2 thread: listening MQTT thread and fota control thread to send FOTA command to ESP (pressing "1" to start FOTA). Before using paho MQTT we need to initialize some callback functions: on_message, on_connect, on_publish, on_subscribe. 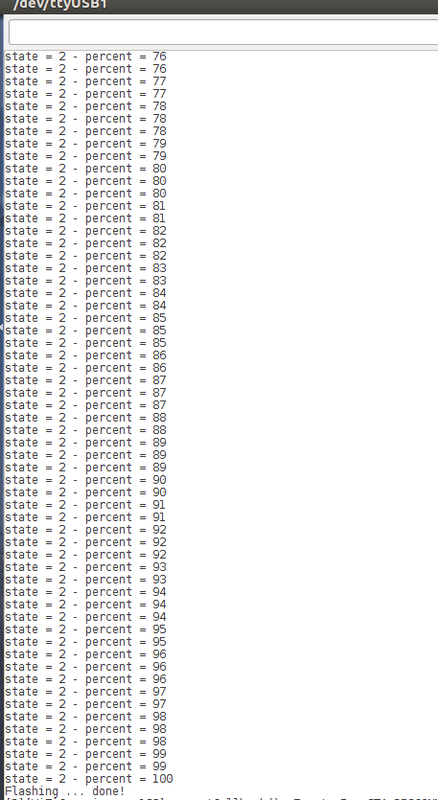 and remove all the code from line 25 to line 71. 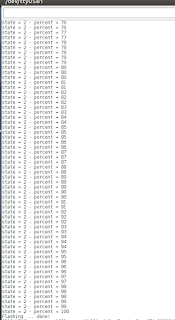 After that set download variable and total variable to the size of binary file. and fill info.md5 with the md5 value of binary file. It should work. In the file "HttpOTA.cpp", I get the error "-1"
and it is correct, if I put it on my phone or on a PC I download the binary file without problems. 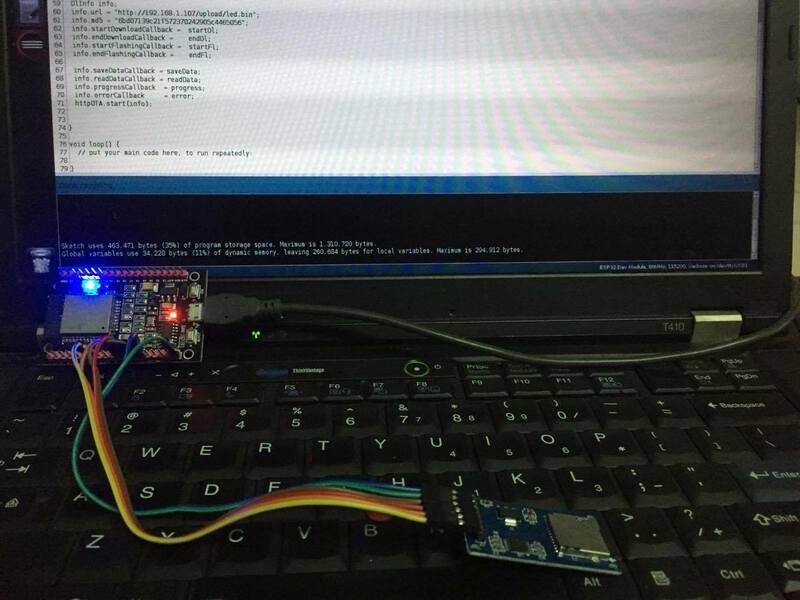 I am using an ESP32 connected with a SIM900, and I get the instruction correctly, as well as the url and the MD5 by MQTT, however when executing "http.begin" it is when take the fail. Hi! If I understood correctly we don't need more separate ESP flash to half for OCTA? We can use available almost .all flash space for OCTA! If ESP has 4Mb flash then update size is almost all flash size? If YES then this is super great! Thanks!